The word University is used in its original sense of people coming together to share and pursue learning in all its forms. There are over 1000 local U3As, all individually registered charities. They are all members of the Third Age Trust which is their national support and advisory body in the UK. The current strap line that sums up our objectives is "LEARN, LIVE and LAUGH"
U3As are autonomous, self-help organisations run by the voluntary efforts of their members. They are self-managed lifelong learning co-operatives for people who are retired or have time to pursue their interests or leisure activities with others. Opportunities are provided for members to share learning experiences in a wide range of interest groups and to pursue learning for fun, not for qualifications. There is much more information on the U3A National Website including member benefits and group resources. To get the best from that site you will need to set up an account with a username and password. The advancement of education and, in particular, the education of older people who are retired from full time work, by all means, including associated activities conducive to the learning and personal development in Milton Keynes and its surrounding locality. 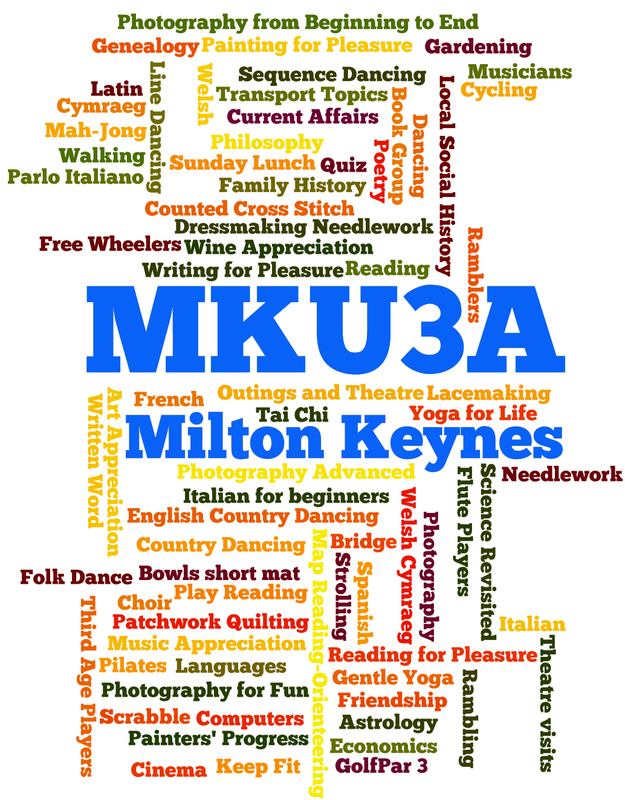 The Wordle below will give you a first feel of the range of activities in the MKU3A. For more detail please go to the Interest Groups Page from the main menu.